Explore all the features of Elfsight Instagram Feed and how they can help you create the most effective widget. Embedding Instagram posts on your website couldn’t be easier. You can display photos from any public Instagram account or by hashtag, location or photo URL and never worry about mixing it all together – any combinations are supported. Tip: Try to avoid using too many sources, because it will slow down the loading speed of the feed. If possible, unite your sources by the same hashtag and display by it. Stay picky in what concerns your feed content. With two filters available, you can carefully choose which photos will be available for your audience. Hide photos from selected profiles or hashtags using “Exclude” filter. While “Only” filter helps you display only from specified public accounts, or with the required tags or photo URLs. 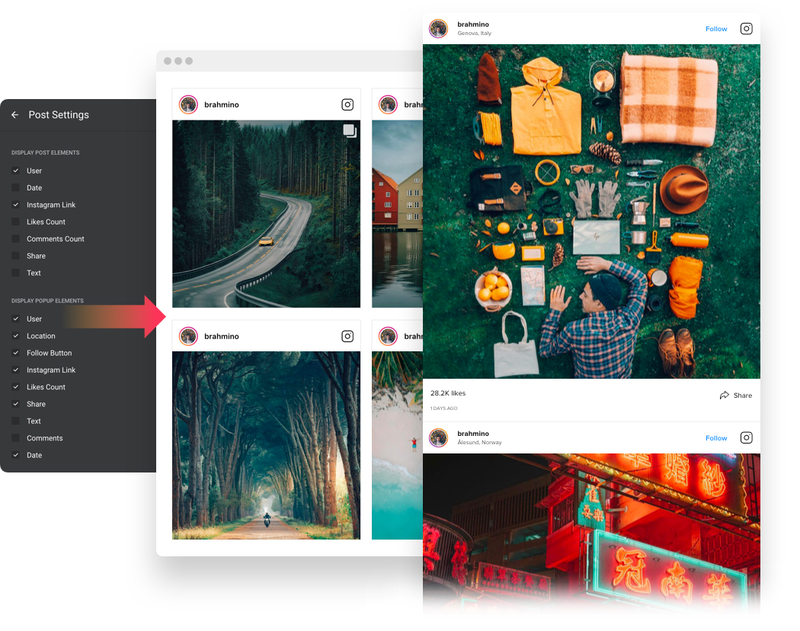 See a selection of real examples to explore the full potential of Instagram Feed for your website. Try all the features of Instagram Feed in live demo now. No fees. No registration. No coding. Find the best way to show your marvellous photos on the website. 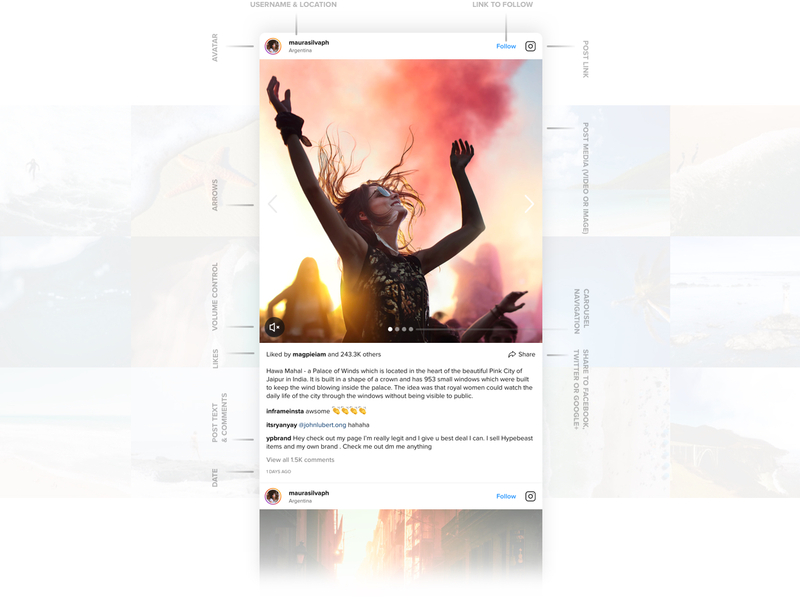 To help you with this, Elfsight Instagram Feed offers two layout options – Slider and Grid. Let your visitors slide through the photos using arrows or pagination; or arrange the photos into a grid that will load the fresh portion of the content on click and allows scrolling. Tip: Apply slider layout, if you want to show photo feed as a stand-alone element of the page. Most often, the best variant is 1 row of photos adjusted to the full screen width. This way the content unit may help substantially increase user engagement and raise the effectiveness of the whole page. Choose what your posts will look like, by picking one of the predefined post templates. Hide details away and demonstrate nothing but your stunning photos with Tile template. 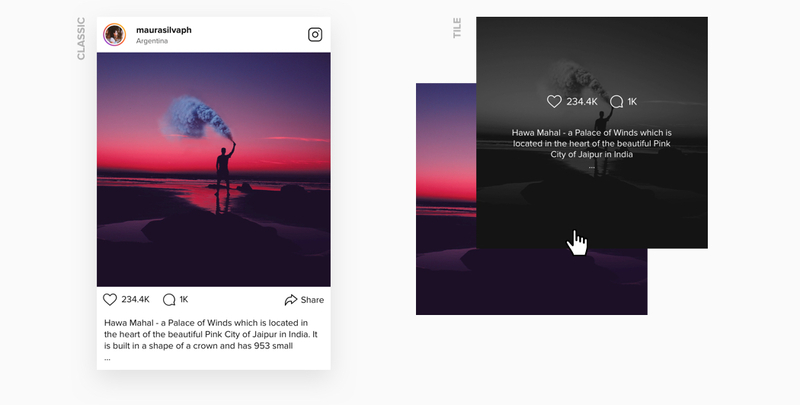 Or save authentic Instagram post design with Classic template that will reveal the name of the user, text, date, comments, likes and more info. You are free to set the content grid according to your own needs. Change the number of columns and rows of photos and see how their size will be adjusted automatically. Thus you can also set the number of posts displayed on the page. Vary the gutter to make photos stand closer to each other or increase the space between them. Try different combinations and find the best one! Tip: Avoid setting too many columns – this will decrease the size of your photos and make them difficult to view. Whatever space requirements you need to meet, you can do it on the fly. Set the desired widget size in pixels in the special box, and the height will adapt automatically to achieve the optimum proportions. The widget is also equipped with mobile optimization and you can be sure that your content will look fantastic on any device. Feel free to create a custom title for your Instagram feed. Be it a name for the photo gallery, reflecting its concept, or a motivating phrase that will catch attention – you only need to type it into the box in the live editor, and your widget will be entitled your own way! With Elfsight Instagram Feed, your content will look spectacular! Popup mode will open photos in full size and play videos right in the feed, with active carousel. Choose which post elements you want to show in Popup: date, location, user, text, comments, call-to-action, follow button and more. Once opened, it makes you keep watching for ages! Don’t wait till your users become active – motivate them to act! 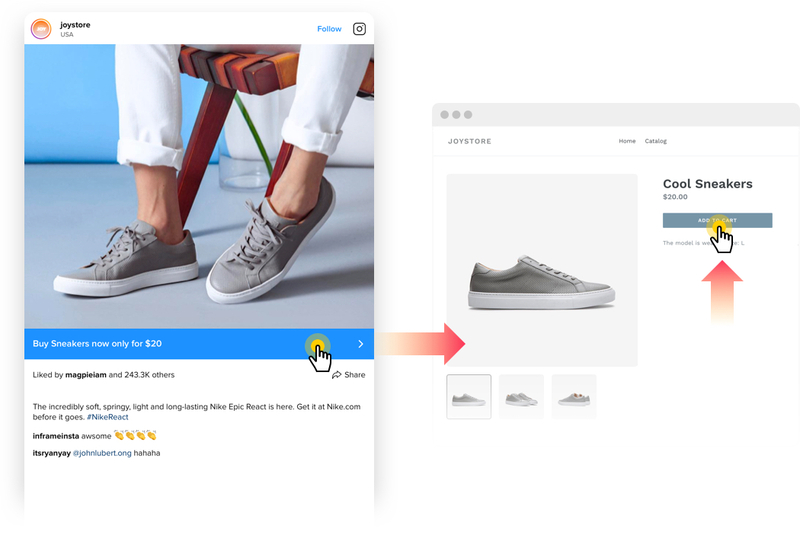 It’s easy to make your Instagram Feed Shoppable using built-incalls-to-action buttons that will link your posts to corresponding products. Direct users to any page just on click. Tip: You can use call-to-action buttons to sell your products. Link the buttons to the pages of the products, shown on the photos. Write conversion-rising button labels, for example, “Buy *the product* for $9.99 now!” and visitors can start purchasing right there. Each post has elements that contribute to visitor engagement: user, date, Instagram link, likes and comments count, share icon, and post text. And there’s even more elements in the popup – it can show comments, location and Follow button. All these can be switched on or off by simply ticking the box in the editor. Add some trendy colors to your Instagram Feed widget with the help of our color schemes. Sky, Dark, Jeans, Nightlife – these are only four out of 12 schemes featuring the most well-balanced color combinations created to fit any website styles and concepts and help you seamlessly integrate the widget. If a dozen of ready color solutions is not enough and you wish to create a really unique widget that will stand out – the option of painting elements in custom colors is at your disposal! 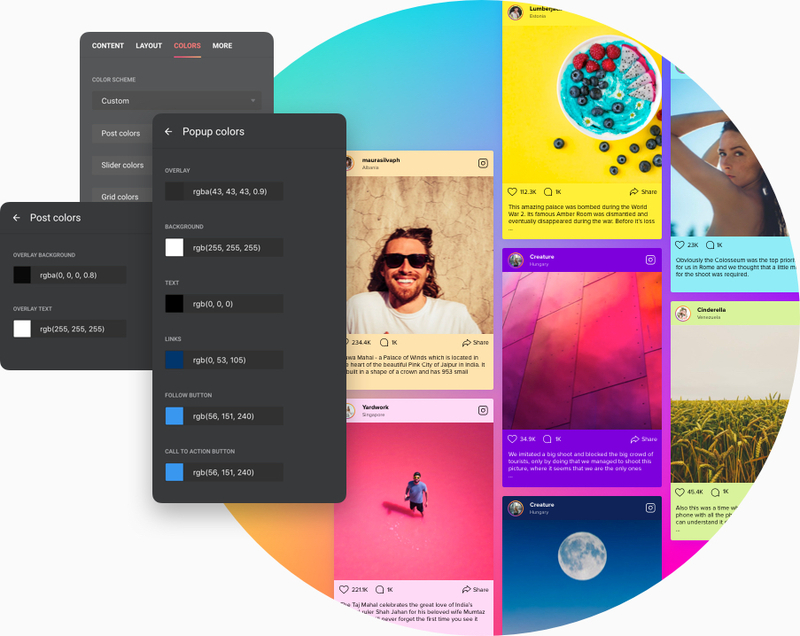 Bring the color everywhere – to Posts, Slider, Grid and Popup – all in all there are 12 components that you can paint!